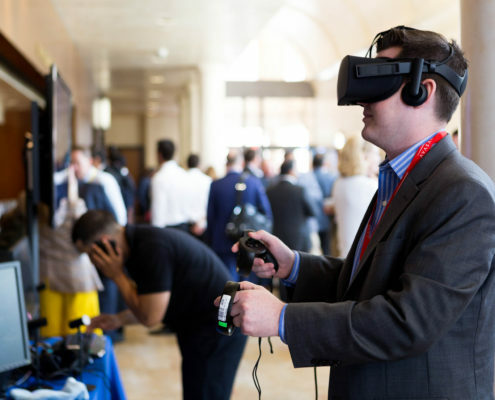 Avasant’s Empowering Beyond Summit 2018 brought together immersive experiences and world-class discussion which placed attendees on the cutting edge of real-world application to technological transformations. Avasant’s Empowering Beyond Summit 2018 was successfully concluded on April 10th 2018 at Warner Bros. Studios in Los Angeles, CA. Avasant’s flagship annual conference featured C-level speakers including Dirk Ahlborn, CEO of Hyperloop, Michelle Mosolgo, CTO at Merck and Co., Jon Winder, CIO at Plan International, Jeanne Holm, Deputy for City of Los Angeles and many more. Over 250 senior executives from major technology providers including IBM, Capgemini, Cognizant, Amazon Web Services, HCL, Accenture, Infosys, Tech Mahindra, and Unisys were in attendance at this sold-out event. The theme for this year’s event was “Innovation Reborn: The Power of Digital to Drive Business Outcomes”, and speakers delivered presentations discussing the role of digital services, automation, artificial intelligence, technology, and disruption in today’s evolving digital economy. The summit opened with a gala reception on April 9th, in conjunction with Golf For Impact, annual charity fundraiser hosted by Avasant Foundation at the Lakeside Golf Club. Ashwin Rangan, CIO of ICANN delivered a stirring keynote focusing on the AI-enabled society and digital workforce and harnessing the “Internet of everything” to build the enterprise of the future. on “Innovation Reborn: The Power of Digital”, Kevin set the tone for a day filled with thought-provoking insights and wisdom. “In today’s Information Age, with unlimited access to information, we’ve become overwhelmed with data that we’re unable to process. The Digital Age promises a future when automation frees humanity to reach its greatest potential,” noted Kevin. 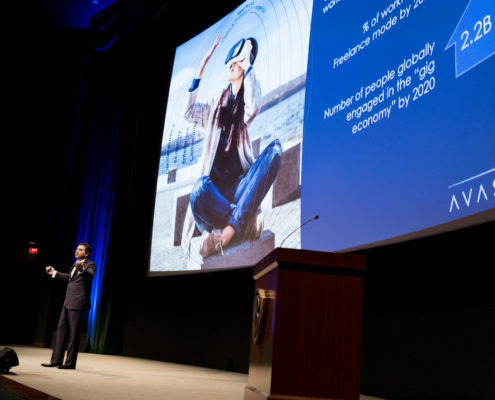 Key speakers such as Hyperloop CEO, Dirk Ahlborn, and Plan International CIO, Jon Winder, shared their insights on innovation and empowering organizations and people toward real-world outcomes via the leveraging of digital technologies and solutions to enrich the human experience. Many of Avasant’s clients spoke about their enterprise transformation initiatives and how they had incorporated digital business solutions, keeping the future consumer in mind. Panel discussions included CXOs including Michelle Mosolgo of Merck & Co., Michele Steele of One America, and Kal Patel of Flextronics, discussing the topic, “The Digital Playbook: How to Survive, Thrive and Out-Compete”. A panel on the topic “Art of the Possible: How Blockchain, AI, AR/VR are Disrupting various industries” featured tech disruptors from Amazon, Warner Bros, from Tesla, and Drake Star Partners. Another panel focused on “From RPA to AI: The Road to Intelligent Automation” with panelists comprising of executives from BB&T Bank, Equifax, UIPath and moderated by Anupam Govil, Partner at Avasant and Chair of Avasant’s Empowering Beyond Summit. The summit was bookended by two noteworthy keynotes, Jeanne Holm, CTO of the City of Los Angeles, discussing the advent of Smart Cities, and Dirk Ahlborn, who shared his vision for building the transportation of the future and how to disrupt existing industries. In keeping with the theme of the event, guests had an exclusive behind the scenes tour of the Warner Bros. Studios, exploring the innovative digital solutions brought to life on and off screen in the entertainment industry. For more information, visit https://avasant.com.